Newsletters — Concept Professional Group Inc. Concept Professional Group Inc.
Take a look at the video showcasing highlights from Get Connected Calgary 2018. We brought our whole team to the conference to learn, network and get Pro-Advisor certified. Almost everyone in Canada or receiving Canadian income has to file an income tax and benefit return. Check our newsletter to check if you are required to file plus read other tax information and tips! How to avoid penalties and interest? 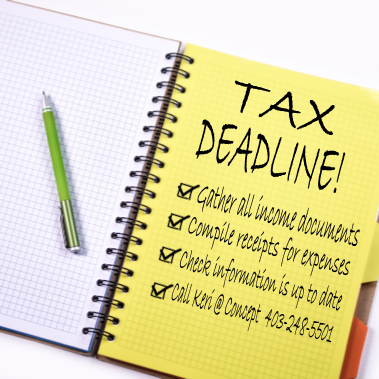 CRA may assess you with penalties and interest if you do not file and pay by the tax-deadline. How to complete and file your tax return? Get ready to file your taxes! Most Canadian Income Tax and Benefit Returns are due every April 30. Check out our latest newsletter for the steps and list of allowable tax deductions and credits. CRA is offering a second chance for those who have made a tax mistake, or left out details about reported income on their tax return. VDP or Voluntary Disclosure Program is a way to ask for relief of prosecution and penalties.